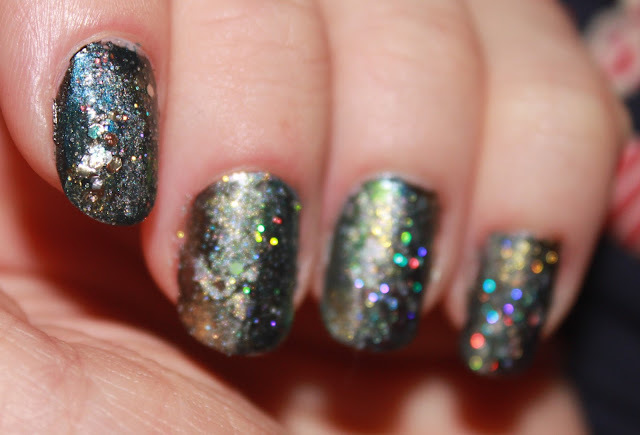 I've been trying for a while to get galaxy perfect nails and have never found an easy way to do it. But I've now found a way that I find fun doing - Even though it's a bit messy! All you need is a bunch of nail varnishes. I went for metallics. Blacks, purples, greens, silvers and golds. 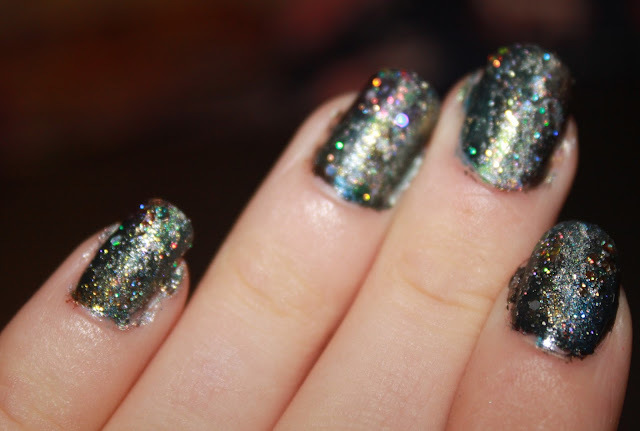 I also took a bunch of glittery shades as well, including a holographic shade. After the first layer is done, it looks pretty messy. Here's a picture of my thumb after the first layer. Excuse my thumbs, I was born with clubbed thumbs. Megan Fox has them so don't judge! As I said before, it looks messy. And quite frankly, a bit horrible! Here's a step by step guide how to get to this point. 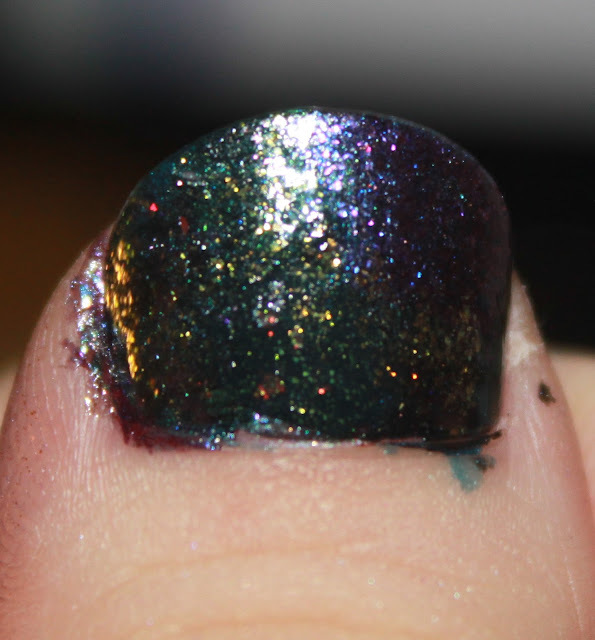 First I apply a metallic black, I did this to all my nails. Apply more polishes in stripes. Keep doing this while it's wet. While it's still wet, apply more polishes. Keep using dark shades and more shimmery ones to create the look you want. I used a gold polish on the top in splodges. Don't use any glittery shades just yet! After you've done this to all the nails it's time to apply stars and other bits. I used a silver nail polish in little amounts on some of my nails to create more dynamics. Then again in little amounts I used hex glittery polishes, such as OPI's The Living Daylights swatched here in little blotches. 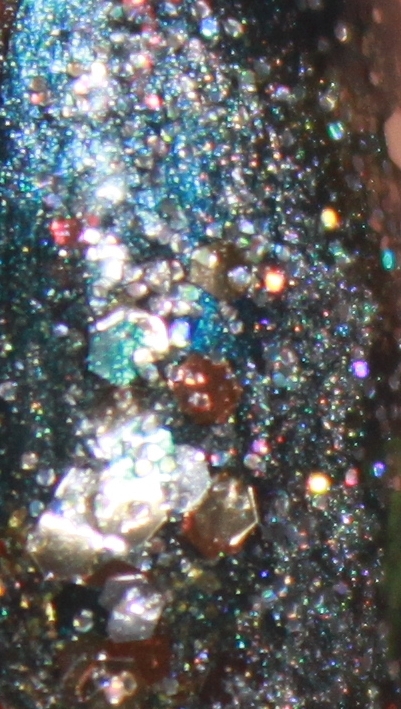 I also did this with a rainbow flake glitter, I used Gosh's polish in Rainbow. After all this had dried I applied a few coats of silver glitter. 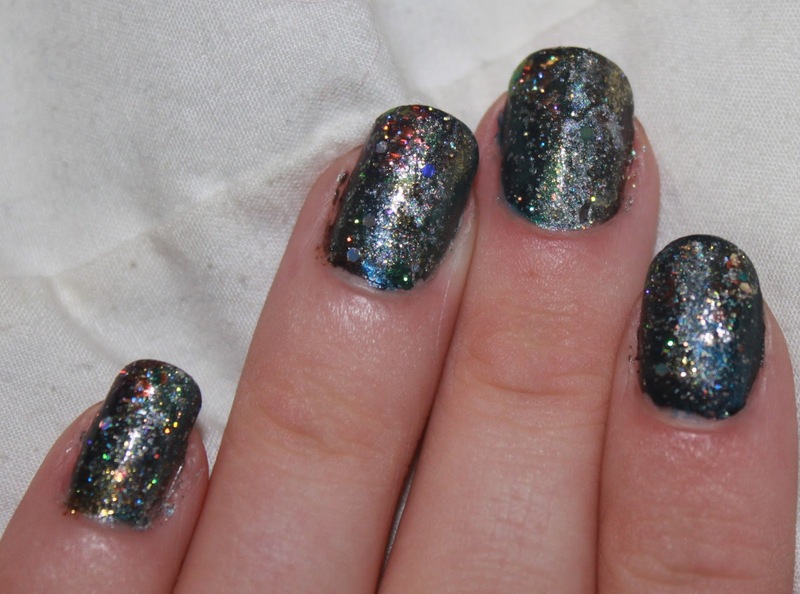 I used OPI's Servin' Up Sparkle which you can see swatched here. 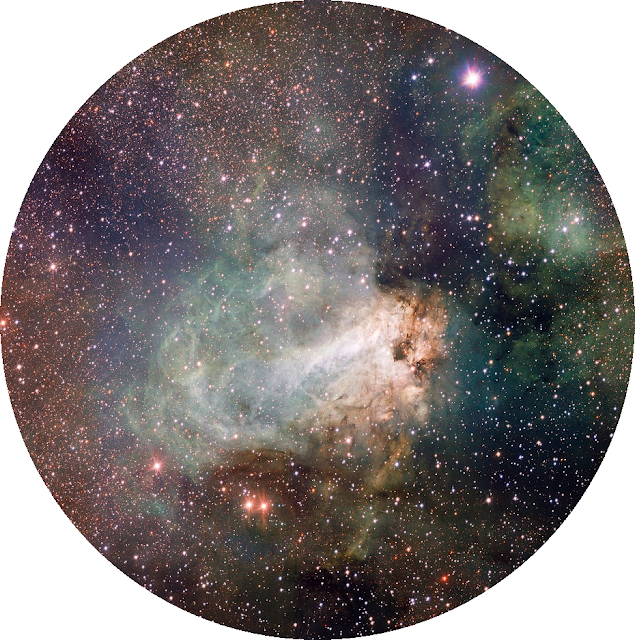 Once that is all dried it looks like a galaxy. It's a bit messy to do. This is actually the first attempt I did at this, and I'm a bit rubbish with nails, so if I can - you can! There's no right or wrong way of doing it. It's just about blending, over lapping and layers. It's all fun and games! I hope you enjoyed this, and let me know if the comments what you think of the final look, and if you tried it let me know how you found doing it. Thanks for reading! So in love with this look, amazing! Ahahaa fair play for uploading a close up of those thumbs! Haaa Love You!! Thanks for finally talking about > "Galaxy Nails" < Loved it! Serious respect for you braving them bad boy hammer thumbs. Love it! It had to be done Ash. Had to show the world at some point..